My over-wintered kale decided it was time to produce seeds in March. We had unusually warm weather in February and March which triggered the kale clock to get on with it and produce the next generation. It bolted, forming single towering stalks with flowers. Normally when vegetable greens bolt they become tough and bitter, good fodder for the compost pile but not good eating. However, the flowers looked so inviting that I pinched off a bud cluster and popped it in my mouth. The bud cluster was mild and sweet and tender! Almost like young broccoli, but milder and much sweeter. I ventured further down the stalk, breaking off pieces, trying them for tenderness and taste. The thin flowering stalks were fine, turning tough only when the stalk was approaching 3/4 inch in diameter. Even the leaves coming off the stalk were not bitter. I stopped grazing. Using kitchen shears, I cut all the flowering stalks off about a foot down, took them to the kitchen and then looked for recipes. My take on a stir-fry type recipe follows at the end of this post. But first let me tell you what has happened since March. The first flowers went for food. A few days later more flowering stalks shot out the sides of the plants, at leaf junctions. These plants are determined to make seeds. A lucky genetic imperative for the garden harvester. Also lucky that the weather turned as cold and wet as a typical Spring here on Puget Sound. I think the continuing cool temperatures are keeping the kale sweet and tender. And the plants continue to produce flowers, which I try to pick before the buds open. I don’t know how long this lucky harvest will last. When warmer weather arrives (soon, I hope) will the kale buds become bitter? Alas, the kale will have to go in mid May anyway, when the summer crops need planting. 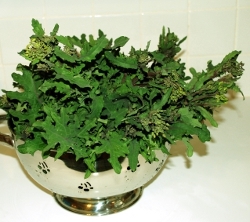 Here’s a quick recipe for the kale flowers. 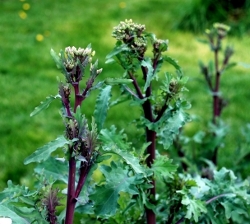 Chop the stalks to about 2 inches in length, but keeping the flower buds intact. If the stalk resists the knife, it’s tough, so keep cutting up the stalk until you get to an easy-to-cut area. Discard the tough stalks. 2-10 cloves garlic, depending on how much you like garlic. I used 10. 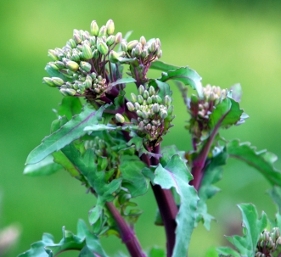 4-6 C. Kale blossoms, leaves and tender stalks. Cut stalks into 2 inch pieces, leave blossom stalks 4-6 inches long. Heat oils in hot pan. Add garlic, stir around for about 2 minutes. Add ginger, red pepper flakes and soy sauce. 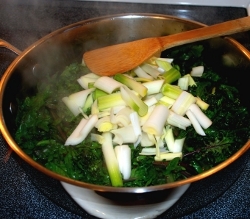 Stir and then add the kale. 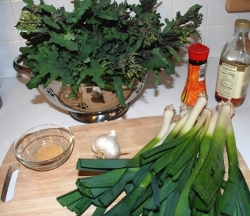 Cover pan and let steam for 3-5 minutes, until green leek parts are tender. Pour in cornstarch slurry to thicken. Thanks for the comment. I just pulled all our over-wintered kale to make room for the summer plantings. Your winters in Maine are probably harsher than ours here in the Puget Sound lowlands, so I’m glad your kale, and even brussel sprouts made it through the winter. By now the kale flowers had fully bloomed and attracted lots of bees. I was sorry to have to take them out. Thanks for visiting. We did not get all our brussel sprouts harvested in the Fall, so in April we picked from our Maine garden the ones that survived the winter. They were good! Thanks for the kale flower recipe. We have been using the new young kale leaves from last year’s plants in salads for a month now. Thankyou for your post, my first time growing Kale and it’s been growing all winter. I was’nt sure if Icould eat any of my plant. It’s flowering and I had no clue what to do with the flowers, cut them off, eat them, leave them… I decided to start picking and eating and it’s not bad at all. Your post made me feel secure in just eating what ever grows as long as it Taste good lol thanks again. I’m glad you mentioned this. I really never ate bolting crops before. I talked to a gardener the other day – he said that he likes kale flowers and the small leaves along the bolting stalk better than the bigger leaves. Who would have thought? I’m going to plant Bussels sprouts in my next winter garden. Good luck with your deer! For some reason, we don’t have any in the garden, although they are often seen just up the road. Perhaps it’s the neighborhood dogs barking in the night. My neighbor three houses away had a deer race down her driveway, cross the yard, jump into the bay and swim off. Amazing. This past winter was my first attempt at a winter garden down here (SW Oregon) – I did try kale, but the deer liked it too much! But sev of my Brussels sprouts decided to put out flowers in March – a lot of flowers! 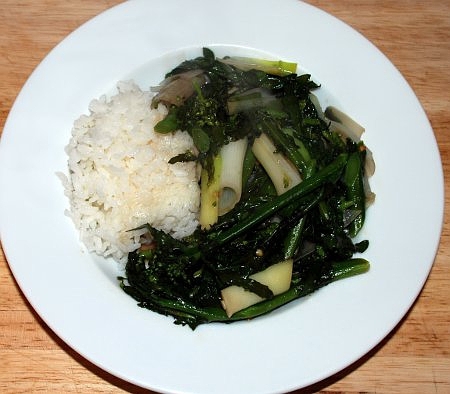 And I thought they looked enough like sprouting broccoli that I’d snip and cook ’em – they were luscious. I think this coming winter I may even get to try kale, ’cause I’m putting up a small electric fence to entertain the deer! It’s a very low power one meant to frighten rather than block entry – a neighbor who has a yard full of roses (undisturbed) told me he has such a fence, only 1 foot high – he claims that bucks are unlikely yard visitors and a doe will enter the fenced area, but if her young will not follow her, she’ll leave.